For my money any DA who say he does not allow plea negotiations has no idea what his job is about. How does he decide what to recommend for a sentence? Or does he not make recommendations? Does he just leave it up to the judge to come up with the sentence without any input from his office? If he does not make recommendations he is not doing his job for the people are entitled to input into a sentence a person is to receive and a judge is entitled to be guided by the representative of the people as well as the defense counsel in the appropriateness of the sentence. Or if he makes recommendations for sentencing how does he do it? Suppose the punishment for a crime such as misleading an investigator is up to 20 years in prison, does he recommend everyone be sentenced to 20 years? Or does he, with others on his staff, look at the person’s background to make a recommendation and if so how do they come up with it? Do they consider the strength of the evidence in a case? Do they consider the integrity or believability of their witnesses? Do they consider the impact of the person’s actions on others or the community? There is so much that goes into making a recommendation that it is a serious business that cries out for due diligence prior to deciding what sentence the prosecution thinks appropriate for a person. Once they have decided upon a sentence in the confines of their office do they seek any input from defense counsel? I assume not if they don’t plea bargain for after all that is what is involved in plea bargaining: you consider from your point of view an appropriate sentence and then you confer with representatives of the defendant to get other input into the matter to decide if there are factors that you were unaware of that may mitigate the sentence. Let me give you an example. I prosecuted a case of a young 18 year old defendant charged with an armed robbery in Needham. He had just been convicted after trial of a bank robbery in Middlesex County based solely on a eye witness identification. He had no record prior to that conviction. He received a 10 year Concord sentence. Examining the case I decided a concurrent sentence with the one he was serving would be appropriate. I told defense counsel I would recommend that on a plea. It would not add any time to the defendant’s time in prison. I expected he would accept it. He turned it down. He wanted his trial. He said he did not do the robbery either in Middlesex or in Needham. This was such a rare happening where a person in prison refused to clear up another case by admitting to the act when it would in effect cost him nothing. Going to trial and being convicted he would end up serving additional time. I delved deeper into the case. To make a long story short I became convinced that the young man did not commit either robbery. I nolle prossed the indictment. Subsequent developments proved me correct. I do not know how a DA can run an office without giving to his staff the ability to plea bargain. Too many things happen at the courthouse that may change the original recommendation. You are dealing with the lives of people and arbitrarily refusing input from defense counsel bespeaks of a fearful DA too timid to do the job correctly and one who is distrustful of the attorneys he hired to do the job. Right off the bat I disliked Cruz’s way of doing business. I know other DAs run their offices in the same way. That I dislike him in no way justifies the unfair attack on him by the Globe. That’s a totally different matter. Seems the more you read into Timmy Cruz’s actions the more it was clear to you that he is a Criminal that needed a good Boston Globe spanking. That being said how many young innocent individual is Cruz locking away for years in the interest of just “winning”? If he wasn’t elected he would have been fired by now. Kudos to you for pulling back the nasty curtain that covers Plymouth county and taking a peek behind it. You may want to close it before you see more. My complaint about DA Cruz was simply that I don’t think you run a DA’s office by prohibiting plea bargaining, if that is the way he runs it. I do not in any way think the man who I do not know is other than an upright man doing his job as he sees it. I do not think he is a criminal, as you suggest. I know little else about his office. If you suggest he is all about “winning” then I would agree with you that is wrong. The idea of a DA is not to win cases but to do justice. There are DAs who want to keep records of winning or losing; where I worked for many years that was not done. We kept no records because we wanted our prosecutors to do the best job possible. That sometimes involved taking cases to trial against defendants with lengthy records even though they were not the strongest; it involved dismissing or refusing to prosecute cases against other defendants where it appeared to be the most just result. >Emphasis added. Do you think Matt is here to entertain you? To be funny? Like a clown? No really..what do you mean? I, for one, would rather stay on the topic at hand,.. but we will see how he feels when he inevitably chimes in on this dialogue. True the blog was started because of Whitey Bulger. 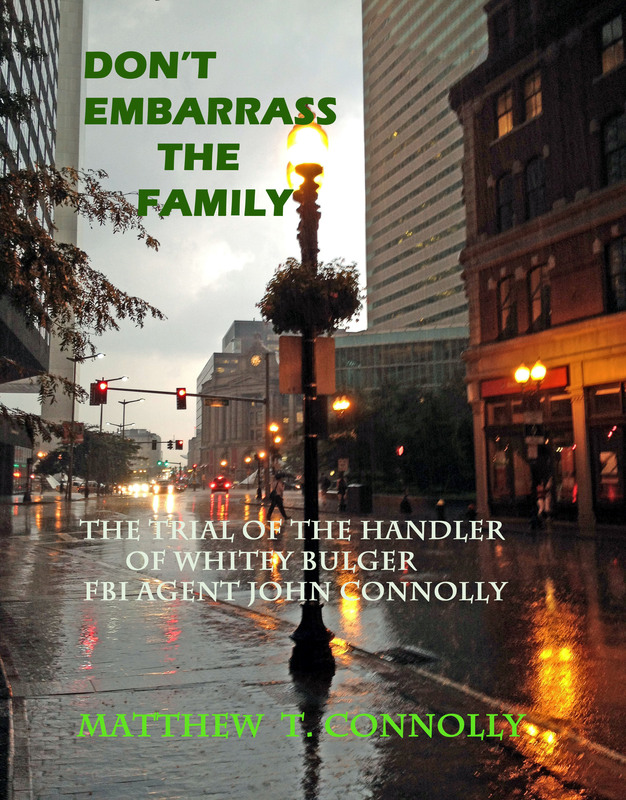 I was involved in the matter because of the John Connolly trial in 2002 which I attended and wrote a book about. I did nothing about the book letting it accumulate dust although I would take it out once in a while and dust it off. When Whitey was arrested in 2011 I recognized that a lot of what was printed in the media seemed not to be accurate. I also thought it would help with understanding his upcoming trial if I started a blog to discuss it and also published the book. Had Whitey not been arrested then neither the book or this blog would have existed. You’ve been around a while so you know I don’t write much about Whitey lately because there is not much to write about. There are many other topics that interest me so I write about them. As for Whitey’s appeal as I’ve told you the end result is a foregone conclusion but if I do read the briefs I may comment on them; I doubt if I’ll drag myself over the bridge to hear the appeal argued but I’m still up in the air about that. I’m spending most of my time on a book which unlike others will connect Whitey and J. Edgar. I‘m having difficulty prying myself out of the first couple of decades of the 20th Century which are a fascinating period in American history which I knew little about. Like America, this blog was started with one idea but it has expanded far beyond that. Love the thinly veiled Joe Pesci/Tommy DeSimone reference. Again you make the right point about the blog. These are my personal observations. I hope some people will consider them and agree or figure out why I am wrong and disagree. The purpose is to engage in a discussion of various topice that I find interesting. I was surprised that Rather who has been here a long time when I’ve ventured all over the world with topics such as Ukraine, Putin, ISIS, Iran etc. would think that I should only talk about Whitey. I’ve even ventured into sports where I am far from being well informed. I have no objection with Rather wanting me to limit myself to what he would like but it is not going to happen. I just hope that those who come here enjoy reading the blog, make a comment if they feel like it, and leave with a few thoughts in their heads about what I said. Thanks for the support. Jeez Declan … What’s the ” Problem ?” … Roll with it … loosen the stocking … As long as commenters are not witless or offensive … or witlesslt offensive … or offensively witless…. then put the English Bobng iceby’s bowler down when you enter the pub for a hydrating ice water on a hot day, and let the starchy tone wilt out of this Blog as it already has out of the… UNIFORM 🙂 .. This is not Mtc’s first time at the Casbah. SLAINTE AND DOUBLE SLAINTE IF ONE IS NOT …. SUFFICIENT 🙂 Stay Cool . It seems we have struck a nerve here. Conspicuously missing is Mr. Connolly’s opinion as to whether the focus should be shifted back to its original intention. Yes, we have expanded, and time and progress wait for no man, but that is why were here in the first place, correct? O’Reilly vs. Stewart is amusing, but it’s not why I come here. I set out my position earlier. There is little to say about Whitey these days. When I go down and visit him I may have more to talk about but his appeal is not going anywhere. I may spend some time discussing it but the race is over and the end won’t be changed. Niether my world nor my blog has ever solely revolved around him. I’m putting together a book on him but much of it will consider J. Edgar Hoover’s background, the FBI and how they created the Whitey myth which might disapppoint people who want to read only about Whitey. You might note the name of the blog is now TTTT. I think those of you that are unhappy with the direction that Matt has chosen to take here should simply exercise your right to go elsewhere. Some of the subjects are fascinating some maybe not so much but it is Matts decision. If you’re not interested, don’t read it. Problem solved. Many were, and if I understand the honest and of course wholly honorable on their clients ‘ behalf, avarice of civil litigation lawyers, among other concerned … entities …then .. Yes … THE SHOW HAS JUST BEGUN 🙂 …. I like Carr. He is a little nutty in his ” Whitey” / THE BROTHERS BULGER and ancillary Irish ” Cottage Industry ” literary … Offshoots 🙂 …. But he gets it about many many things. Gelzinis definitely has his moments though not a regular old ” Whitey Whisperer” like Friend HL Carr. Gelzinis described JJB sitting on his dais as it were in the O’s, sharp right as soon as you’re in the door and at the elbows end of the bar @ the stone wall ; vaporously lumuniscent like the gloaming on a Irish moor, as ….. ” Sitting there like a twisted Buddha. ” I did not appreciate the line, but it is pretty damn good. Then the Globe expanded the definition of plea bargain to include all kinds of deals. But nothing in the article supports the contention that judges have criticized him over his plea bargaining or deal making tactics. I assumed tha autheticity of the quote. I did not conceive that it would be manufactured out of thin air since it was in quotes. Perhaps I am wrong in doing that if it is not a correct quote. But I think the gist of my article was not so much that Cruz didn’t plea bargain but that any DA who doesn’t is not doing the job. If Cruz did not say that then I owe him an apology for believing the Globe’s quote was accurate. He is not the only DA that would have had that policy. As a young defense attorney John Droney in Middlesex also had it. It was frustrating dealing with an ADA who would say “they wrote down the recommendation in the file and I can’t deviate from it.” I’d have to try cases and end up with the same result I could have gotten without a trial. You are right that the article confuses “plea bargaining” with making deals with people to provide evidence. They are two different situations which the Globe presents as the same thing but as I noted the Globe is way off base in criticizing Cruz under any circumstances. I was going to write another post on the issue of the judges, I may yet, but again there is not criticism from the judges as you suggest about the plea bargaining. Plus, when judges criticiz the DAs that is often a sign that the DA is doing his job. I’ve been writing about many other subjects other than Whitey since the blog began. He was the main focus up through his trial but even before then I went off to other topics. If I stuck to writing about Whitey I’d have pretty much been out of business since a few weeks after his tria. Err, as I was saying, I think Bulger’s appeal is hopeless. He claims that a now-dead federal prosecutor, Jeremiah O’Sullivan, offered him immunity for all his crimes, including murder. Because Bulger denies being an informer, he couldn’t say O’Sullivan did this in exchange for information. So he claims O’Sullivan offered him immunity in exchange for “my protection of his life.” So it appears as if Bulger was granted a “license to kill” in exchange for becoming Jeremiah O’Sullivan’s guardian angel! Even if you ignore that there’s no documentary evidence to support this claim, it’s extremely difficult to believe. On this one, I’d have to say that Bulger is playing in the same league as the Easter Bunny and the tooth fairy. Absolutely right. His appeal is hopeless and everyone is just going through the motions. It would be against public policy for anyone to tell a person he can commit whatever crimes he wishes and he will be protected. For one thing, O’Sullivan is on oath saying no agreement between him and Bulger ever existed. For another, defense counsel did not properly save the issue. There is no evidence or even offer of proof on file as to what happened between Whitey and O’Sullivan. To preserve that issue there must be more than the word of counsel like an affidavit to the effect that “Whitey would testify etc.” which should have been presented in the district court. You are right about the league he is playing in but so is this whole story about Whitey which has been blown far out of proportion. Then there’s a more practical reason. The Court of Appeals will look to see if justice is done. There is no doubt that Whitey laundered the money, extorted the bookies, possessed the guns, and committed several other criminal acts aside from the murders. There will be no sympathy for Whitey. So even if he had good points on appeal, which he doesn’t, the appeals judges are not going to have this circus brought back into town. Mr. JPC. His detractors admit even that. I am certain that many native Bostonians met and or ” Knew.” him . It is a small town … geographically. The epistemological basis of my questions notwithstanding, it is the questions themselves that deserve attention by any person not easily gulled, and requiring the satisfaction of rational and satisfactory answers: not sheeps’ wool pulled over our eyes. My fellow Bostonians. Not to many “regular” people looked into the cold, menacing Bulger baby-blues unless he wanted them to. I never met him. Back in the 80’s the rumor was he would disguise himself as an old lady occasionally. Ricky Marinick described it best (loosely quoted)…. he was always felt but rarely seen..he was like a black cloud that was always there hanging over the neighborhood… and occasionally a lightning bolt would come down and strike… and that was him….. you didn’t see Whitey unless Whitey had a problem with you. Mr McDonald — What is the point of your comment? I don’t get it. Do you know or have ever met Jimmy B? What way has “he always been”??? I can’t wait to hear his answer. But mine is that he is acutely aware of the gravity of the upcoming appeal of James Bulger and would like to see a little more focus on that than fillers like personal opinion pieces on Cruz, etc. The original name of this blog was The Trial of Whitey Bulger. Maybe Matt will start a new one, The Appeal of Whitey Bulger to get back to the intended scope and subject which brought us all here in the first place. The original name did relate to Whitey Bu;ger as you suggest. His trial has been over for a long time but even during the time prior to his trial when I first started the blog and up through it I considered other topics that piqued my interest. One, Annie Dookham, had me appearing on a nightly news show. I’ve changed the name of the blog although I cannot change the Internet site without disappearing into the void of Internet Space to its present TTTT – Trecking Toward The Truth which gives me the ability to continue on. Had I been limited to Whitey Bulger stuff I would have been silent for months. As for his appeal, that will only consider the actions that happened in the lower court. There will be no testimony. Whitey as as much chance of winning that as Boston does during this time of global warming to see the snowiest winter in its history. I may or may not write something about the appeal. It really does not interest me because there are no appealable issues and if there were any, like the idea of Whitey having some type of immunity, the issue was not properly saved. Thank you for responding so fully and thoughtfully. I have been here since close to the beginning and have always respected you, your blog, your chosen content, and your other commenters and have tried to show that by trying to contribute something positive to the conversation as best I could at all times. If my above words offended you, then I apologize… that was not my intention. I fully realize that there is a better chance of palm trees sprouting up on Malibu Beach than Whitey winning his appeal. If you remember, I originally only asked you if you thought he would testify. Seemed like a relevant question with the Appeal looming in a few weeks. My line of thought was this… everyone knows his appeal is futile, including presumably him. So why is he doing it? There has got to be something else afoot. He was just showing apparent remorse (albeit mostly for himself, but also his family) with the letter to the high school girls. I thought he might be setting the stage for some other bombshell due to the timing with the Appeal coming. It surely will be going through the motions, unless the old dog has one more trick up his sleeve. I don’t mean anything that would change the outcome, but anything…a statement, an apology, an acknowledgement in any way, shape, or form that could put even the smallest measure of closure on the subject. I admit that I was let down by the trial, and perplexed why such a person with his pronounced traits would let his last chance at being in the limelight and/or running the show pass him by. It would be an interesting intellectual exercise at minimum for you to extend the same disinterested, dispassionate, and discerning juridical savoir ” let’s be ‘ faire’ now ” 🙂 to the JJ Bulger Appeal issues as you do in your ” Tiffin” with DA Cruz ; speaking of ” cups of tea ” and all. I’m reading the tea leaves on Jimmy Bulger. He cannot be ” Outworked. ” He has always been this way.